Potential attack or just a random drunk Texas guy? No name or backstory yet. 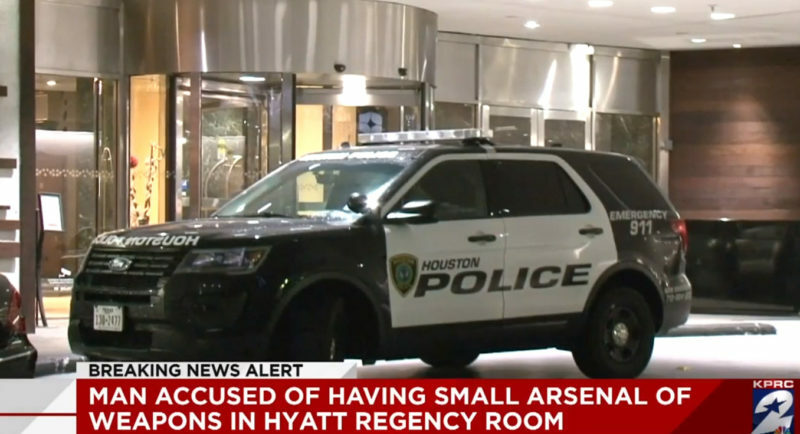 KSAT: A man has been arrested on multiple charges after police located a small arsenal of guns on the top floor of the Hyatt Regency on Louisiana Street downtown, Houston police said. Police at the hotel called for backup around 1:30 a.m. Sunday after they attempted to arrest the man for being intoxicated and trespassing. When help arrived, police noticed ammunition laying around the man’s hotel room, Lt. Gordon Macintosh with Houston police said.